Join us for an afternoon/evening of fun in a beautiful, fall outdoor setting, surrounded by white lights and great tunes, with a bonfire to keep you warm on the outside and tasty chow and beverages to keep you warm on the inside. The silent auction will have a fabulous array of items, just in time for the holidays. The location is the future home of Well Worn Paws, CCF's future senior canine sanctuary. 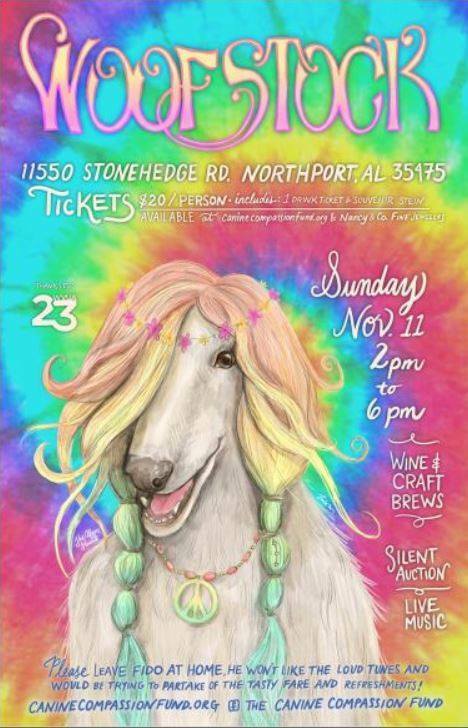 Event emceed by canine lover and WVUA reporter, Chelsea Barton. $20 per person, admission includes a souvenir stein and 1 drink ticket. Some tables available, but patrons are invited to bring their own comfy chairs and/or picnic blankets. Get your tickets at Nancy & Co. Fine Jewelers, 1848 McFarland Blvd., Northport, online at www.CanineCompassionFund.org/support-giving or via our Facebook page - The Canine Compassion Fund. Tickets purchased online will be available for pick up at the gate on the day of event. ABC License/Permit #: 240/011114463, Division C.